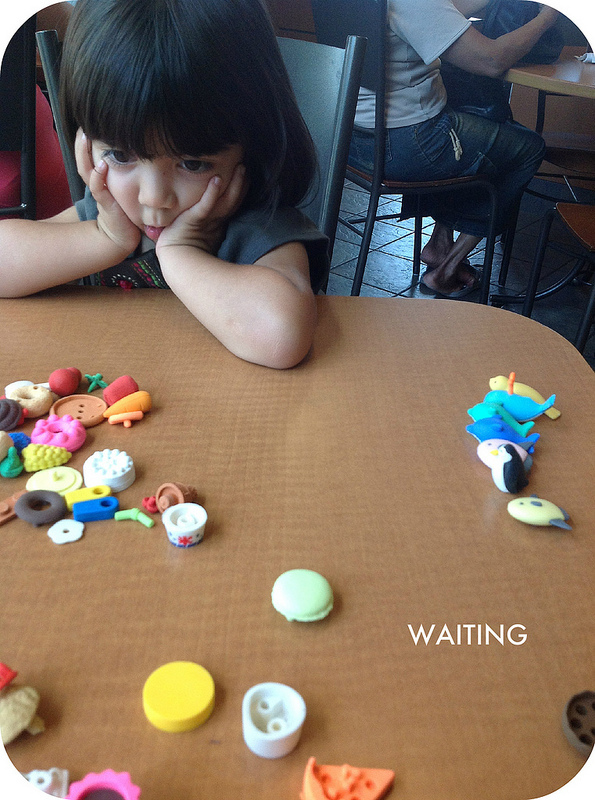 I took this photo of Chloe last weekend at Tim Horton's as we were waiting for HandyMan to get our lunch. Like most times when we're out at restaurants, I pull out a toy or crayons for her to play with while we wait for the food. I always like to have something small and portable with me, to hold her attention when she's in a stroller or on a long car ride or when she's running around like a monkey and I need her to just. sit. still. Anyone else know what that's like? :) What's your child's favourite toys these days? A stack of Post-it notes and a pen have come in really handy with my 3yo. She loves doing little sketches or 'name tags' and sticking them around the table. Oh my goodness, I rushed right out to the dollar store after seeing this! I'm in Ottawa and they had the same ones here too! We are going to a wedding this weekend and this will be PERFECT for keeping the kids entertained at the table! Thank you so much!!! I remember doing that too when my kiddos were young. Another thing they liked were knock-knock jokes. I knew tons of them and we would just rattle them off. It worked for situations when we couldn't have any toys out. This is a great idea, same with the other comments. We are embarking on a 23 hour, yes you read it right, CAR trip with a 2 year old and 1 month old. We are looking for ideas on what we can pack in the car to entertain the 2 year old as long as possible. Suggestions are welcome! My 4 years old son is currently obsessed with drawing everything so markers, crayons and color pencils and any piece of paper, even a piece of toilet paper, keep him busy for along time...and I am happy! What a great idea! My little one is into drawing right now. It's all about the papers and markers and crayolas at our place and when we're out tooling around these days. Lego. Even a small handful of pieces can keep them entertained for a while. Since my children are 30 and 35 years old now I don't usually have this problem but I used to love Colorforms which were paper thin pictures. They could be stuck and unstuck into the book that they came in and also on the car windows etc. They were great on car trips and in restaurants. Fun! 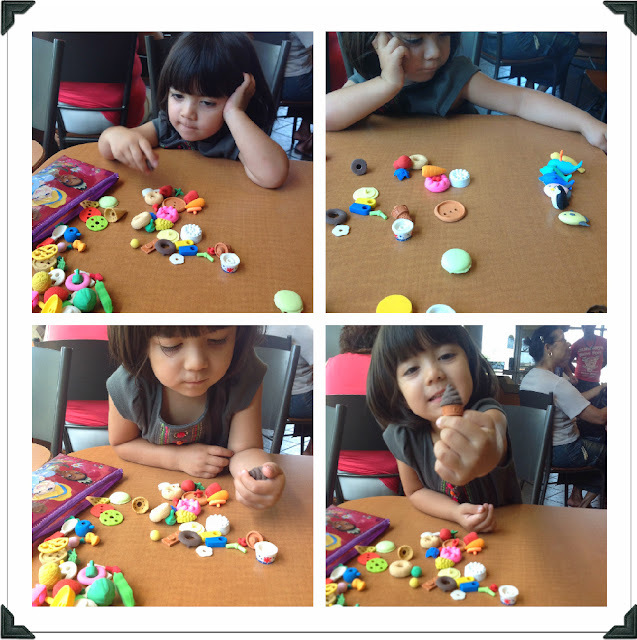 I only give her the erasers for "take out" too, so that the novelty of it doesn't wear off. Chloe is so cute! I saw those japanese erasers you're talking about today at the dollar store while looking for some props for my grandma's 85 birthday that is coming up soon!! That is such a good way to keep kids occupied. My uncle likes to bring a portable tv for his kid but i don't necessarily agree with using technology to keep them busy. I like your method a lot better. Interactions and being creative is the way to go. Just be sure not to get any with ball-shaped parts. I'm forever picking the miniature peas off the floor! I so need to do this! James is 28 months and really needs something other than crayons to play with when we go to a restaurant. You've just inspired me to take him to the dollar store and create a little "take out" bag for him. We already have a small Elmo backpack that will be perfect for him. Too cute! We always kept books or comic books in the car so the kids could bring them into restaurants with us. Sometimes we would also tote along activity books. The kids are now teenagers and we still tell them to bring in a book, though these days there is some competition from electronics! great idea jen. I think I have walked by these. I will pick up this weekend b/c I think they would be a good distraction on a plane! What a great idea! I'll have to look for those next time I'm at the dollar store. I've always got a few cars & trucks in my purse, but they tend to be loud crashing games, so perhaps a little cupcake and ice cream making would be more restaurant appropriate :) My hubs tends to watch national geographic animal videos with H as a distraction while waiting for things. Chloe just gets cuter and cuter! Love when you post about her!